This quick and easy hat is great for the fun loving and carefree souls in your life. There are no decreases in the crown which makes this pattern fast and easy. The simple leaf pattern combined with the square shape makes this hat irresistible, just like catnip and the kitties that inspired it. 130 yds per 100 grams in contrasting colors. 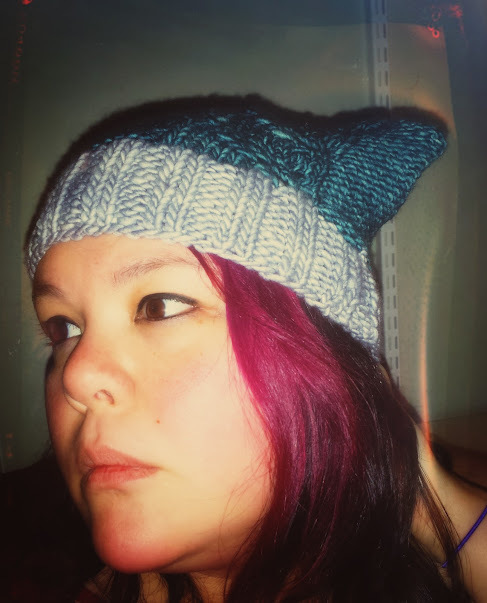 71g of yarn was used for 1 adult sized hat. Using the long tail cast on, loosely CO 64(74) stitches. Join in the round and place a marker to indicate beginning of the round. Knit in 2×2 rib for 11 rounds , cut yarn and leave a 6 inch tail. Join contrasting color and Knit one round. 1. p5 ( yo, k, yo, sl 1 k-wise, k2tog, psso, k6) purl to end of the round. 2. For Round 2 and all other even rows work as follows: p5, k10, purl to end of the round. 3. p5 ( k, yo, k, yo k, sl1 k-wise, k2tog, psso , k4) purl to the end of the round. 5. p5 ( k2, yo, k, yo, k2, sl1 k-wise, k2tog, psso, k2) purl to the end of the round. 7. p5 ( k3, yo, k, yo, k3, sl1 k-wise, k2tog, psso) purl to the end of the round. Repeat rounds 1-8 three more times. After working the last repeat of the 8th round, turn hat inside out. Using the three needle bind off technique, bind off loosely. Block hat and weave in ends.